Could Rugby Union ever overtake the NFL in popularity in the USA? 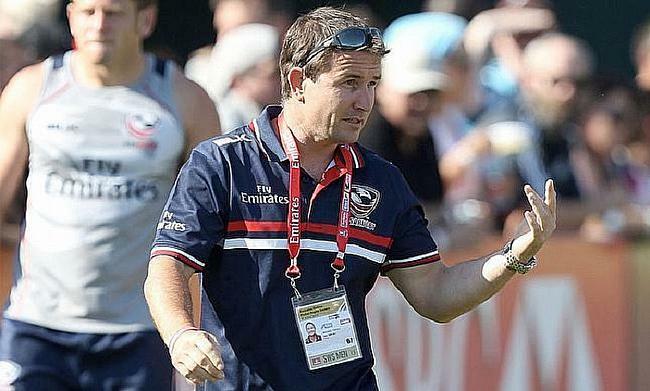 USA Men’s 7s Head Coach Mike Friday believes hosting the Rugby World Cup Sevens is a wonderful chance to help promote the game in the States. After a brief recovery from a long Sevens season, 29 different nations will gather in San Francisco for both the Men’s and Women’s competitions which begin on July 20th. Rugby Union has been trying to gain interest across the pond for quite a while and Friday insists America can embrace the sport of Rugby Sevens and he and his side cannot wait to grasp the opportunity. He said: “It will be huge. It is the first Rugby World Cup on American soil. The talk is that it will be a sell-out across all three days at AT&T Park. “I think the American sporting population will be captivated with it and buy in to it. I think they will love the game because it is made for them! I think the opportunity is big and hopefully we can go good in the tournament. That is a big part of it because Americans love winners. “We are hugely excited. Last time we played on home soil [in Las Vegas] it was all good for us. We are building and getting better. Despite the positivity around the competition, one aspect of the World Cup which Friday is not looking forward to is the format of the tournament. USA are one of many teams which regularly plies their trade on the HSBC World Series circuit, which adopts a pool system, but the World Cup will be a straight knockout event. “A thing that doesn’t sit well with me is the format of the tournament,” Friday told TRU. “We have a real opportunity to showcase the sport in America and captivate that audience, but I am very disappointed with the format that has been adopted because we have gone away from a system which works which is fair and delivers a product which allows the best team to achieve success. “If you take Paris earlier in the season as an example, South Africa were slightly off for two minutes and they lost their opening game, yet they went on to win the tournament. “They would have been home in the World Cup and that would be a travesty. It is a long way to fly for many teams and its expensive too and because it is straight knockout, it is like going to the casino. It is just roulette. Friday guided the Eagles to fifth place in this year’s World Series, with their only tour victory coming in Las Vegas, as they continue to try and break into the top four. A poor start to this year’s competition in Dubai - where they lost all three of their pool matches - hampered their chances this term and their inconsistency has frustrated the USA coach. “We see it as missed opportunities, added Friday. “We thought it was a real chance for us to break into the top four this season. One of the aspects which is holding the USA back from competing more frequently with the likes of New Zealand and South Africa is the funding and resources available to them. With American Football and Basketball still dominating the sporting landscape in the USA, Friday admits it is tough for rugby to promote itself in order for the Eagles to keep building in the right direction. A recent victory over Scotland for the XV-a-side team plus the introduction of ‘Major League Rugby’ is certainly a positive as USA Rugby aim to continue moving forward. Friday said: “We know what we’re dealing with. We are trying to find new members of the squad who we can nurture and develop over the next few years by setting up an academy to try and promote the sport. “But, that takes dollars and unfortunately, even though we are a tier one country with a tier one economy, we don’t have the budget which the traditional tier one nations have. That is the reality of it all. “The MLR [Major League Rugby] is a great start point for helping develop players and these are baby steps. The imagination and opportunity to create something that has sustainability and will gather momentum for an attractive, multi-team game in America is there. We just need to focus on the rugby pockets and not try and hit all 51 states. And USA will be challenging themselves against some of the frontrunners in Rugby Sevens over this weekend and Friday is hoping the Eagles can be successful as they aim to encourage more people to get involved with the sport. Meet the 12 Men who will represent the United States at Rugby World Cup Sevens 2018, and the final two ready to jump in as traveling reserves. ?????? He added: “We want to inspire the next generation of rugby players. We want our players to be role-models. They can’t be Tom Brady or Steph Curry, but they can be an Olympian and achieve success in this sport. The likes of Perrie Baker, Carlin Isles and Martin Iosefo are the current stars of US Rugby and they will have to wait to until just after 21:37 US time for their first fixture of the World Cup this Friday which will be against either Wales or Zimbabwe.